01 February, 2019 (Toronto, ON) – Music legend Barry White released his first solo album with 20th Century Records in 1973. His string of hugely successful singles and albums established him as music’s leading pioneer of orchestral soul, a genre that became a staple in the 1970s and beyond. Backing his work throughout his seven years with the label was Love Unlimited Orchestra, a 40-piece ensemble conducted by White himself. Their biggest single, 1973’s “Love’s Theme”, went to No. 1 in the U.S. and No. 10 in the U.K. White also produced releases for the label by the female vocal trio, Love Unlimited, whose 1975 single, “I Belong To You”, hit No. 1 on Billboard’s R&B singles chart. On March 29, Mercury/Ume/Universal Music Canada, the country’s leading music company, will release a new 7CD box set, Love Unlimited Orchestra: The 20th Century Records Albums (1973-1979). On the same date, new vinyl LP reissues for three of the group’s albums, plus two albums by Love Unlimited, will also be released. 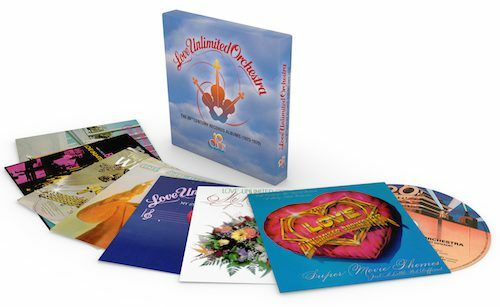 The Love Unlimited Orchestra box set brings together, for the first time, all seven albums the group recorded for the label, newly remastered from their original analog master tapes for the first time since their 1970s debuts. The albums are presented with their original sleeve and label art for the 7CD box set and for the new vinyl LP reissues. The five vinyl LPs were cut at Abbey Road Studios and pressed on high quality 180-gram vinyl to guarantee optimal audio quality. Mercury/UMe’s Barry White / 20th Century Records reissue program was launched in 2018 with box set releases of White’s remastered solo albums and singles from his tenure with the label. 15 years since his untimely death in 2003 at the age of 58, the global campaign honours Barry White’s legendary career by restoring these classic albums and presenting them together. Rhapsody In White is Love Unlimited Orchestra’s 1973 debut studio album. It was a huge success for the Barry White-led group, led by the “Love's Theme” single, their signature song that hit No. 1 on the Billboard Hot 100. The album, which also includes the bedroom classic “Midnight And You” featuring Barry White’s distinctive vocal, peaked at No. 2 on Billboard’s R&B Albums chart. White Gold is Love Unlimited Orchestra’s third LP and their second of 1974 (following the Together Brothers soundtrack album). The album peaked at No. 10 on Billboard’s R&B Albums chart and it featured “Satin Soul,” which reached No. 22 on the Billboard Hot 100. My Sweet Summer Suite is Love Unlimited Orchestra’s fifth LP, released in 1976, the same year that Barry White released his seminal Let The Music Play LP. The LP’s title song was a No. 1 Dance Chart smash, while its new pressing features the original long version of “Strange Games & Things,” a track which has become a cult favorite for hip-hop fans and producers.